The Pearce Institute in Govan, also known as the PI, held an inspiring crowd this past Monday. For the eighth meeting of the Glasgow Green Tease, we welcomed Catherine Lee from the Bamboo Curtain Artist Residency in Taiwan and artist Nic Green to share their work with the group. Both Catherine and Nic are working around and within the theme of rivers, particularly speaking to the intertwining of environmental and social implications of these waterways. Catherine started the evening with a discussion of Bamboo Curtain Artist Residency’s Plum Tree Creek project which has taken place over the past two years. Located in Zhuwei, a suburb of Taipei, Plum Tree Creek is a small, but locally significant, tributary that runs between the Danshui River and Datuen Mountain. Despite its ecological significance, many of the residents of Zhuwei had lived oblivious or indifferent to the creek for many years. The artists at Bamboo Curtain realised the creek’s lack of prominence to the local community, and felt determined to change this. Employing a series of five projects, Bamboo Curtain Artist Residency was able to build awareness of Plum Tree Creek and its ecological importance to the region. The project’s tagline “Mending the Broken Land with Water” speaks to the concept driving the project. As Catherine explained, “as artists we can do certain things to evoke,” as thus the river was evoked to the community of Zhuwei. “Breakfast at Plum Tree Creek” was a roaming series of breakfasts, formatted quite similar to our Green Tease events, along the route of the creek. By moving people from downstream to upstream, the group was able to notice differences in the health of the river by comparing the amount of litter and purity of the water. “Colourful Affairs with Plants” spoke to the local ecological life of the area. School students walked along the river and were able to see the changing conditions of environmental health. Plant life was collected to create dyes, so the ultimate output was a craft created from their experience. Through their reinterpretation of public art’s identity and function, Bamboo Curtain Artist Residency acted as a catalyst. With pollution sources such as domestic sewage, agricultural run-off and nearby golf course synthetic fertilisation, the creek is far from pristine. However, through their involvement with the project, community members now advocate to their local governments for improvements. Catherine explained to us that the project was slow to start, but now the efforts are in high demand. Local people have a desire to become involved and to impact policy decisions respective to the environmental quality in their area. The project, heavily controlled by Bamboo Curtain Artist Residencies to begin with, has now been handed back to the community. 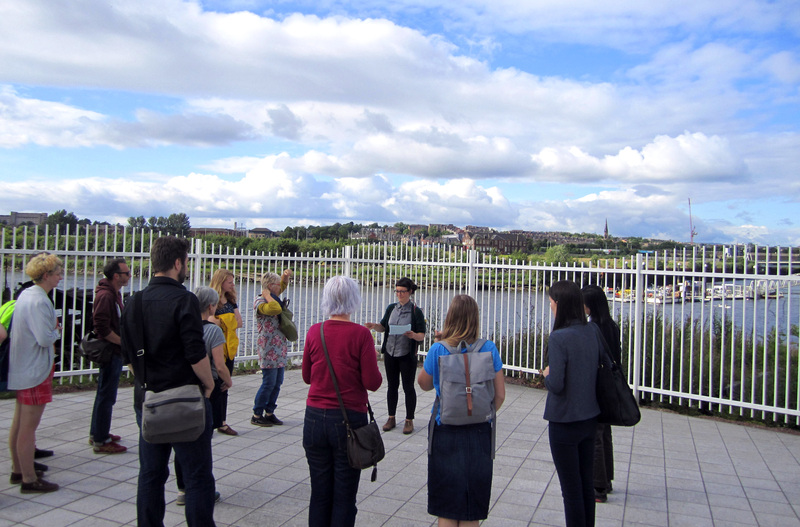 For the second portion of our Green Tease gathering, artist Nic Green led a walk along the River Clyde in Govan. An area of Glasgow that has had many identities, Nic has been working with Govan locals to unearth histories of the community. Nic explained that her work along the river originally began with her interest in waste, and the metal waste found in the River Clyde. She then realised the disconnect many residents felt with the river, and tried to explore ways to forge a reconnection. Nic alluded to the many layers of her research involving Govan, including the historical, geographical, geological, spiritual and political amongst others. This multi-faceted approach has led to a rich series of projects. A quotation she referenced at our starting point (“The Clyde made Glasgow and Glasgow made the Clyde”) resonated for the duration of the walk. Another interesting detail was that the River Clyde was originally thought of as a connecting force, not a barrier with references to Govan still existing on the other side of the river. These philosophies provide an interesting contrast, explaining some of the present-day tensions surrounding this area of Glasgow. Nic’s current project involves teaching local residents traditional craft skills. Working with GalGael, locals are learning how to craft bells that will become part of a river installation performance. GalGael is an organisation that teaches often forgotten skills that were once relevant to Govan’s industries, such as boat building, weaving and bell forging. As Nic noted, throughout the many changes Govan has seen, a sense of community has remained, which has fuelled the recent shift of the area to a creative incubator for community initiatives. The concluding points of the evening included discussing the future of Green Tease events in Glasgow. Possibilities in the future include more outings and member-suggested venues, playing to the ecology of the group by sustaining activity through active participation, contribution and rotating leadership. This past Green Tease was a wonderful interaction of local and international communities, and the weather could not have been better for our evening wander. Keep in touch for further information to follow about future Green Tease events.